For 20 years Jason Ringenberg and his band Jason and the Scorchers have ignited the "roots rock" genre with their own fiery brand of country/hard rock. 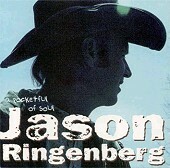 Now, with his second solo effort, Pocketful Of Soul, Ringenberg's songwriting moves front and center with 12 cuts of stripped-down, acoustic country that harkens back to the country's pre-cookie cutter era (when the song itself really mattered) and highlights his easily recognizable nasally twang (vocals that fit the style like a glove) like never before. Although raw and simple, Jason takes this batch of originals and a few covers and turns in a beautiful collection of tunes that are heartfelt, passionate and real.